3D Ready Function, bright vivid projection image true to life Built-in Android, you can download apps or directly playing online video and TV Support wireless screen synchronization with iOS device, Android Phone and PC, Tablet Built-in Bluetooth 4.0, convenient and simple to connect with other devices. Model Number- RF00040. Model- Cube. Mini Tripod. LOCAL PICKUP. 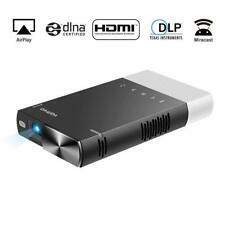 C6 Mini Wireless Home Theater Projector. Condition is Used. Bought it at a sale plugged it in seems to work good. Does not have remote control. Buying as is no returns. Let me know if you have any questions. Thank you. QKK 2400 Lux Mini Projector -Full HD LED Projector 1080P Upgraded 2018! *NEW*. Shipped with USPS Priority Mail. Big good news! Buy projector,get free mini bracket. Only 3 pieces of the free mini bracket. Buy Projector, Get Free Mini Bracket. 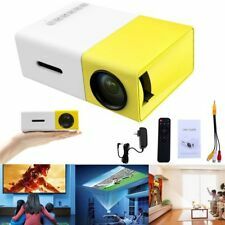 Opened box, item new, excellent condition, fully inspected and tested, comes as shown in photos// QKK Mini Projector -Full HD LED Projector 1080P Supported, 50,000 Hour Lamp Life. Shipped with USPS Priority Mail. QKK mini projector, 2 count, great projector for occasional viewing of sports and movies at night or in mostly dark viewing great picture for the price. both have brown spots on the polarizing glass which is easily replaced. Different from TV, projector avoid direct light source through diffuse refection, providing less harm to eyes, more protection for kids, more comfort to parents. Projection Screen. �� Support front, rear and ceiling projection, fits for Table, Tripod, Wall/ Ceiling Mount. This is in PERFECT WORKING ORDER and excellent condition – no scratches, no blemishes. Check out the pictures.T his is NOT a grey market item. There is not a warranty associated with this item so it is sold as-is. Projector HAUSBELL 1500ANSI Lumens LED Luminous efficiency Mini Portable Vid E6. Shipped with USPS Priority Mail. Take your family movie night to the next level with a mini projector you can use inside or outside! With an easy-to-use miniature projector, you can show movies, home videos, and other media the way they were meant to be seen. Discover the power of the mini projector by purchasing one on eBay. Can you use a mini projector with a smartphone? Miniature projectors are made to work with many different video sources, including smartphones, laptops, desktops, and memory cards. 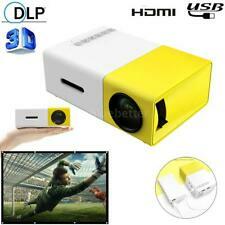 This allows you to play home videos, movies, music videos, and other media at a much larger size. Looking at a video on your smartphone can be tricky, especially if you also want to be able to show it to other people at the same time. 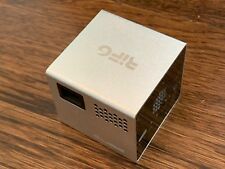 With a miniature projector, you simply connect to the media source using one of the supplied cords, and you are able to project the playback onto a large screen, wall, or hanging sheet. You can even sync the projection with your smartphone screen to ensure uninterrupted playback. How big is the projection from a miniature projector? Can you use a mini projector outside? Outdoor projection is simple with a miniature projector. Just hook it up to the source you want to use to play a video, and project it against an exterior wall of your home, a backyard fence, a large screen or sheet, or any other flat surface. With this feature, you can enjoy watching a movie in the backyard. There's no need to rush to get to your seats before the movie starts because you can customize playback and start anytime you like. It's also easy to move when the show is over or if you notice the weather turning sour. Create new memories your family will cherish with the help of an easy-to-use projector.